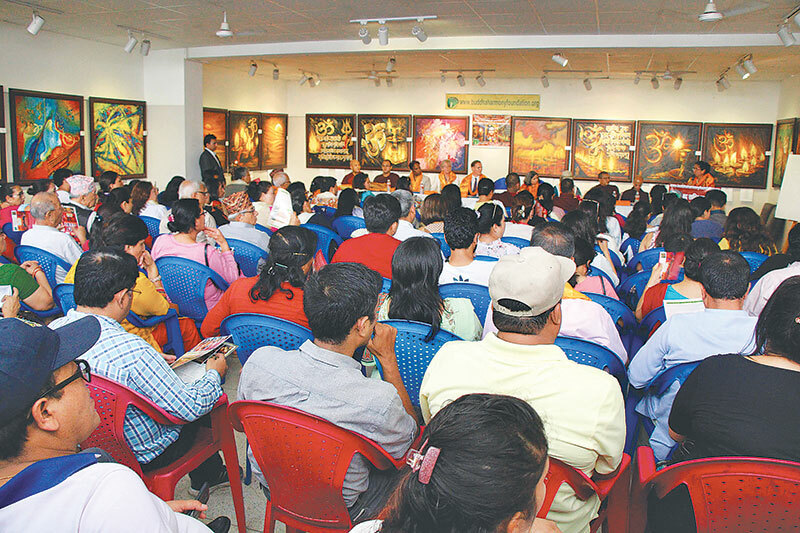 Jul 12, 2018-Artist Sandhya Regmi’s ninth solo painting exhibition, Guide Me from Darkness to Light, kicked off at Nepal Art Council, Babar Mahal, on July 9. The exhibition was inaugurated by the Ambassador of the Federal Republic of Germany, Roland Shcaefer, amid a function chaired by the monk Kondanya Mahastavir. The exhibition has on display a new series of 33 paintings by Regmi which consists of spiritual paintings with subjects like lamps, Om, Gayatri Mantra, Mahamrityunjaya Mantra, and other semi-abstract and abstract paintings. The paintings touch on themes ranging from spiritualism, Yoga, meditation to the ‘Rage of Nature’, ‘Victory of Truth’, and ‘Liberation Delight’, among others. Artist Regmi is noted for connecting life with spiritual lights, seeking to inspire people to overcome tragedies. Artist Regmi’s eighth solo exhibit, titled My Motherland Nepal Gloriously Stretched amidst the Endless Sky, at the same venue, in 2014. Her seventh solo show was titled Faces of Buddha.